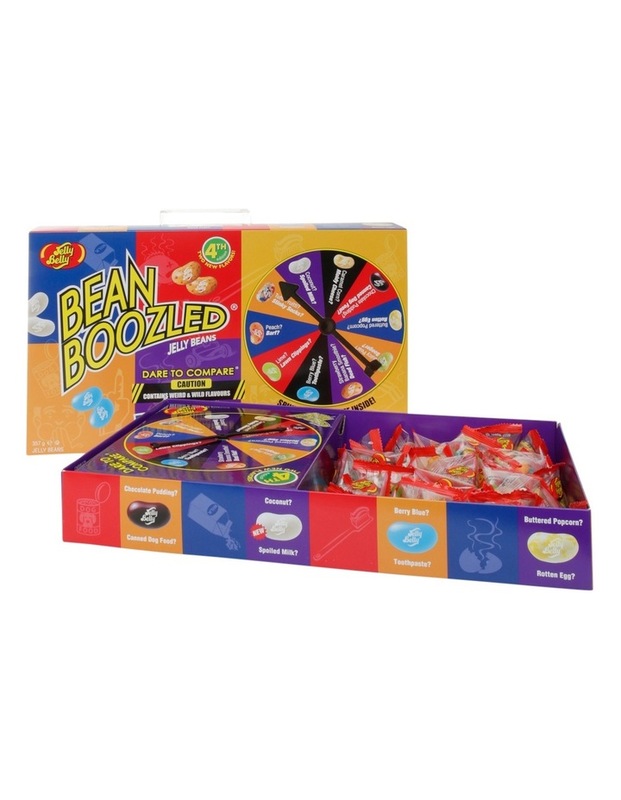 The Jelly Belly BeanBoozled Jumbo Spinner Box contains contains a colourful mix of jelly beans featuring yummy flavours and weird flavours. The weird flavours look just like the yummy flavours so can never be sure what flavour you have picked until you put the bean in your mouth. In the box you will find a spin wheel, spin the wheel to decide what bean you eat. Will it taste great or gross? 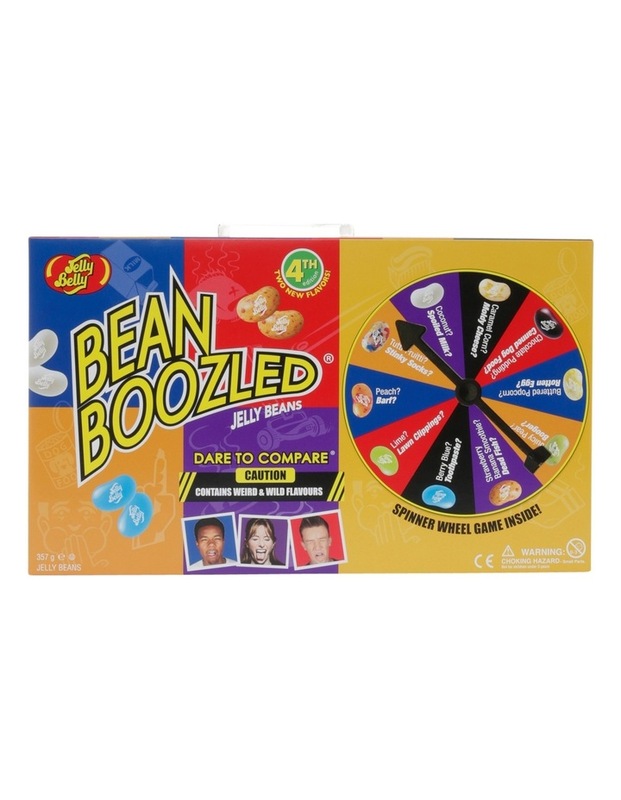 Take on the challenge to dare and compare with the BeanBoozled Spinner box! Flavours of jelly beans: Booger, Skunk Spray, Chocolate Pudding, Caramel Corn, Tutti-Fruitti, Licorice, Canned Dog Food, Juicy Pear, Coconut, Mouldy Cheese, Barf, Spoiled Milk, Rotten Egg, Stinky Socks, Buttered Popcorn, Lime, Dead Fish, Peach, Strawberry Banana Smoothie and Lawn Clippings. The jelly beans are randomly assorted and may not contain every flavour. These jelly beans are gluten-free, gelatine-free, made in a peanut-free facility. Jelly Belly jelly beans take between 7 to 14 days to make, and each jelly bean. They use natural ingredients whenever possible, and prides themselves on creating innovative, "true-to-life" flavours in the center and the shell make each bite a flavor adventure. Jelly Belly is family-owned and operated company. The familys candy-making roots can be traced back to 1869. Today, the fourth, fifth, and sixth generation continues the sweet tradition.